There are many varieties of mustard greens to choose from, with different leaf forms and color of leaves that range from medium green through dark green, purple and red. Also known as Chinese mustard, Indian mustard, they are Brassica juncea from the Brassicaceae Family. Mustard greens are nutritious and easy to grow and are rich in vitamins K, C, E, and folate and beta carotene. Mustard greens may be planted all year round in Sydney which is a temperate zone, thought they do best and have their best flavour in cooler weather. Growth habits and planting needs. Select a sunny sight that receives full sun or part shade. Mustard greens require a well-drained soil fertile soil that is high in organic matter with a pH 6.0 to 7.5. and can tolerate a slightly alkaline soil. Prepare the bed by digging in well aged compost and chicken or cow manure to a depth of 30 cm. Leafy plants need lots of nitrogen for leaf and healthy stalk growth so mustard greens should follow a legume crop in the crop rotation system. Legumes are nitrogen fixing and will provide the nitogen needed by these hungry leafy plants. Sow the seeds 6 mm to 12 mm deep, 2.5 cm apart in rows 15 to 20 cm apart and keep moist until germination. The seeds will germinate in 4 -7 days. When the seedlings have grown thin to 15 cm apart for small varieties, or up to 45 cm for large ones. The plants will mature to a height of 15 to 60 cm with a spread of 30-60 cm depending on the variety chosen so they need plenty of space to develop a good root system. Throughout the growing period mustard greens will need plentiful, consistent moisture to keep the leaves growing quickly and so ensure good flavour. Mulch well to conserve water and also to prevent weeds competing with the mustard greens for nutrients and water. Feed fortnightly with diluted fish emulsion. Continue to sow seeds every 2 weeks for continuous harvest. 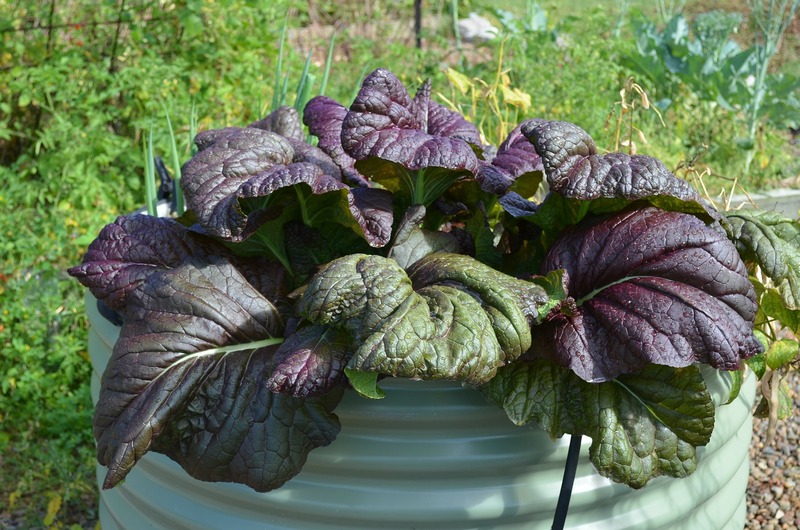 Mustard greens may bolt quickly in high temperatures. These conditions and lack of moisture will increase their peppery taste. The plants will mature to a height of 15 to 60 cm with a spread of 30-60 cm depending on the variety chosen. The plants will be ready to harvest in 5-8 weeks. Harvest the leaves, using scissors, when they are about 7 – 10 cm long from the outside of the plant leaving the younger inner leaves to continue growing to maintain the plant. Store the leaves unwashed until needed in the crisper drawer of the refrigerator. Lightly steam, stir fry or sautee or just use the tender leaves raw in a mixed salad.